We can only imagine how horrific it currently is for the people of Central Sulawesi, following the magnitude 7.5 earthquake that struck Donggala and Palu on late Friday afternoon 28th Sept 2018. The damaging tsunami which struck Palu Bay at incredible speeds a reported 30mins after the quake happened, caused widespread destruction. This was on top of significant damage due to the earthquakes north of the city and also along the Palu-Koru Fault. Tsunami waves as high as 5.5m crashed ashore in the already damaged city, destroying buildings, smashing vehicles and killing hundreds of people. 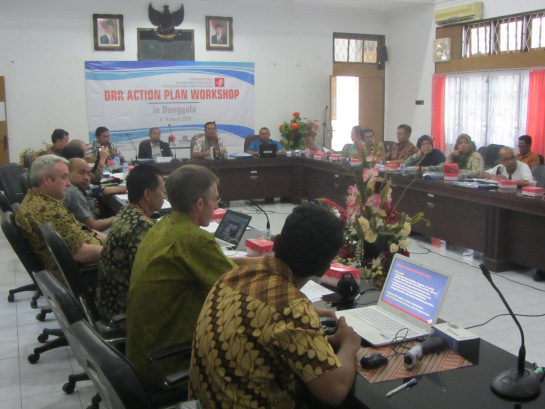 Palu and Donggala are both StIRRRD (Strengthened Indonesian Resilience – Reducing Risk from Disasters) districts and the StIRRRD team have been working in these areas over the past 7 years. We have many colleagues and friends in the community and we wait anxiously for news of how they are. The team were last in Palu and Donggala in March 2018, installing seismometers in three schools in the area, plus one at the university. The seismometers are intended as an educational tool to help the students understand the seismology of the area and to stimulate discussions about earthquakes and tsunami; their causes, hazard mitigation, preparedness and response actions. Students learned the importance of natural warnings for tsunami, and how to Drop, Cover and Hold. We hope these discussions in March were able to help those teachers and students with their actions in this event. The current death toll has exceeded 840 and is expected to rise sharply over the coming days and weeks, leaving the StIRRRD team deeply concerned for our friends and colleagues who we’ve not been able to contact. In addition to the death toll, an estimated 2.4 million people have been affected, with six hundred people hospitalised and 48,000 people displaced. The isolation of affected communities and the scarcity of resources is making response efforts difficult. The tsunami was bigger than anticipated and the generation mechanism likely more complex than originally thought. The fault that ruptured on Friday was a so-called strike-slip fault, in which the earth movement is largely horizontal. That kind of movement would not ordinarily create a tsunami. However, a strike-slip fault might have some amount of vertical motion that could displace seawater. The fault’s rupture zone, may pass through an area where the seafloor rises or drops off, so that when the fault moves during the quake, it pushes seawater in front of it. Another possibility is that the tsunami was created by an undersea landslide, caused by the intense shaking. Determining the exact cause of the tsunami will have to wait until the sea floor can be examined. The shape of Palu Bay has no doubt contributed to the size of the waves in Palu, with the waves’ energy being focused (amplified) along the hairpin-shaped bay. Tadulako University was also about to host its first international conference on Urban Disaster Resilience in November 2018. Michele is co-director of StIRRRD (Strengthened Indonesian Resilience – Reducing Risk from Disasters), a New Zealand Aid Programme funded 5-year project to build the DRR capacity of local government and universities in Indonesia.